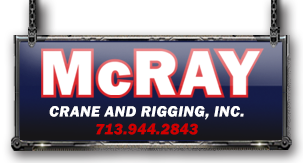 McRay Crane and Rigging is a great place to work. We realize that our people are our most valuable asset. It is their skill, dedication and loyalty that has made our success possible. Many of our employees have been with us for more than 15 years. We seek out great people, people who are talented, experienced, conscientious, and dependable. If you have the skills, experience, and attitude to become a valuable member of our family, we want to hear from you. Click here to APPLY ONLINE. You may also stop by our office and complete an application or fax your resume to 713.944.1253.